We came across a really interesting example that exemplifies the difference in the way people in the private sector think versus how people who work for government think! In the private sector, thanks to modern computing technologies, many businesses are able to automate a vital portion of their businesses: the taking of orders for their goods and services. The technology allows the businesses to serve the needs of their customers 24 hours a day, 7 days a week, even if their employees only work from 9:00 AM to 5:00 PM on Monday through Friday. Everybody wins in the process – customers can order what they want whenever it is convenient for them and the business can collect revenue generating orders even when its employees are off the clock. But in the public sector, government bureaucrats apparently cannot tolerate providing that level of service, even when they use the same technologies. Warren Meyer came across what may be a classic example of how bureaucrats think such technology should be used from the IRS. 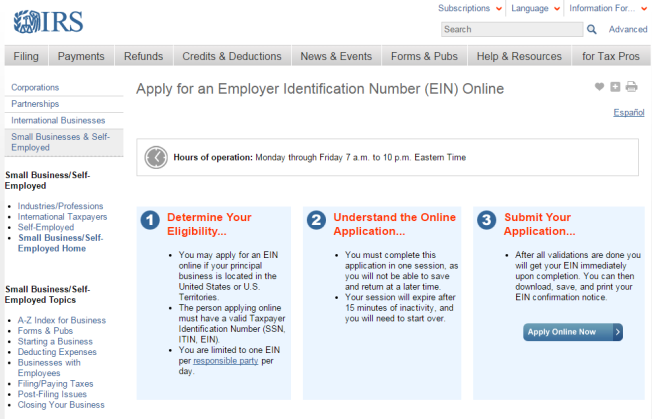 The screen shot below is taken from the IRS’ site for applying for Employer Identification Numbers online. You see that correctly – the IRS’ automated online application website for Employer Identification Numbers closes down on both weekends and from 10:00 PM to 7:00 AM Eastern time every weekday. The following screen shot shows the message an applicant receives when they attempt to “Apply Online Now” during the periods outside of the IRS’ hours of operation for the website. The IRS operates the most popular U.S. government website. 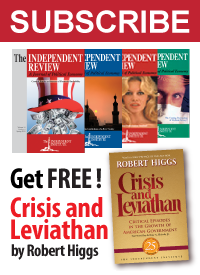 What this state of affairs demonstrates is a certain amount of contempt that the IRS’ bureaucrats would appear to have not just for regular Americans, but very specifically for people who seek to create both businesses and jobs in the United States. After all, who else would ever need to apply for an Employer Identification Number to facilitate their ability to pay taxes to the U.S. government for both themselves and for the employees whose federal taxes they will act as the government’s agent to withhold? By forcing such productive people to wait until 7:00 AM on Mondays through Fridays to apply for an Employer Identification Number, the IRS’ bureaucrats gain two main benefits for themselves. They demonstrate their power to compel regular Americans to comply with their arbitrary requirements. They avoid having the situation where their employees are burdened by having to process the applications for Employer Identification Numbers that accumulated either overnight or worse, over the weekend, minimizing their morning workloads. Because doing otherwise might be inconvenient for themselves. We considered the possibility that limiting the Employer Identification Number application process to certain hours of operation might limit the potential for fraud, but clearly, the limited hours of operation are no barrier to that crime. If you can think of any other benefits for the IRS’ bureaucrats, please add them in the comments!